The Gulf Stream transports ocean heat across the Atlantic towards the northeast and this gives rise to thriving palm trees in Ireland and allows ports to remain ice-free during the winter. Likewise, most ocean currents have a large impact on the global climate. Since when did this system work the way we know it today? And how did it develop? Ocean currents play a major factor in our climate. The Gulf Stream transports so much heat from the tropical Atlantic towards the northeast that the winters in northern Europe are relatively mild and humid in relation to other regions at similar latitudes. This transport of heat simultaneously causes a cooling down in the South Atlantic, a process known as heat piracy. 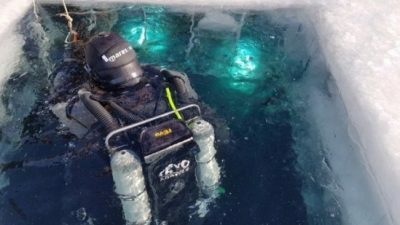 However, the pattern of today's global ocean currents is relatively recent, having developed during the Pliocene era, a mere six to two and a half million years ago. The movement of tectonic plates has an impact on the opening and closing of straits / channels. The extent to which the present-day heat piracy in the North Atlantic has evolved in the face of tectonic changes is insufficiently understood. 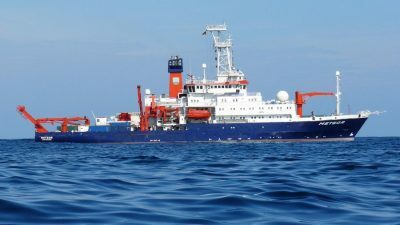 An international team of paleo-oceanographers, with the collaboration of GEOMAR, has published their findings about the process in a recent issue of the Scientific Reports journal. Deep sea drilling in the North and South Atlantic formed the foundation for the new findings, in the form of core samples taken from the seabed. Fossils of single-celled microorganisms (foraminifera) have been found in these cores. 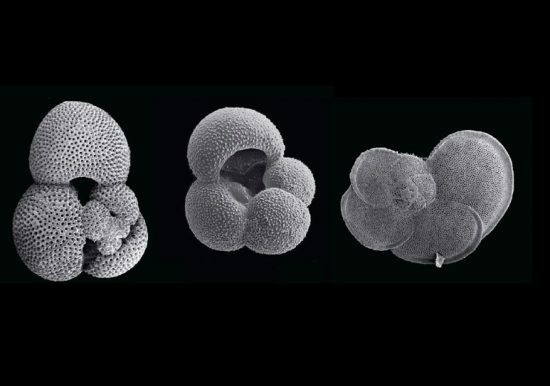 According to first author Dr Cyrus Karas from Lamont-Doherty Earth Observatory in the US, if the isotopes and trace metals in the foraminifera were measured, the data would allow them to reconstruct the physical conditions of oceans in the past (such as oceanic temperatures) very accurately. “The Pliocene in fact is an epoch in Earth history, which is characterised by extremely dynamic plate-tectonic movements,” said co-author Dirk Nuernberg from GEOMAR. “Our study shows that the tectonic changes in the Strait of Gibraltar in the Mediterranean, the formation of the Central American land bridge, and the constriction of the Indonesian Seaway have had immense subsequent impacts on the global oceanic overturning circulation over time, and thus on the temperatures in the North and South Atlantic”. A change in the Mediterranean throughflow about 5.3 million years ago weakened the Atlantic Overturning Circulation, leading to a warming of the South Atlantic in relation to the North Atlantic. Then, between 4.8 and 3.8 million years ago, the oceanic connection between the Atlantic and Pacific narrowed. When the Central American landbridge was formed, this connection closed. 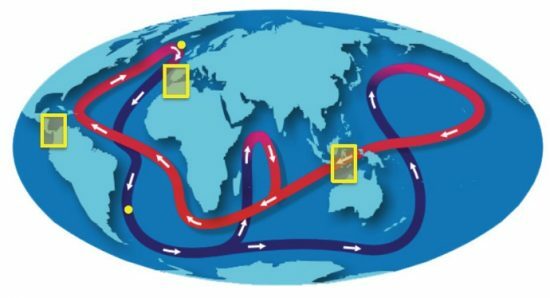 This process intensified the Gulf Stream, causing the North Atlantic to warm by circa two degrees Celsius at the expense of the South Atlantic – expressing active heat piracy that lasts to this day. With the tectonic constriction of the Indonesian sea route 3.8 to three million years ago, a weakening of the global recirculation circulation could be detected from the geochemical data, which is related to the start of glaciations of the Northern Hemisphere. 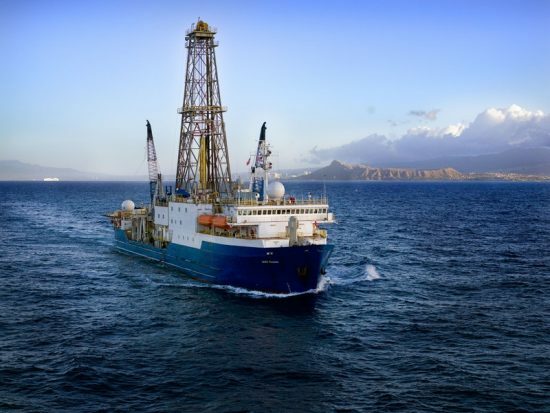 “The importance of our paleoceanographic study is to provide evidence of how local tectonic changes have radically altered the ocean temperatures in the North and South Atlantic and thus, effectively influenced global climate,” said Dr Karas.